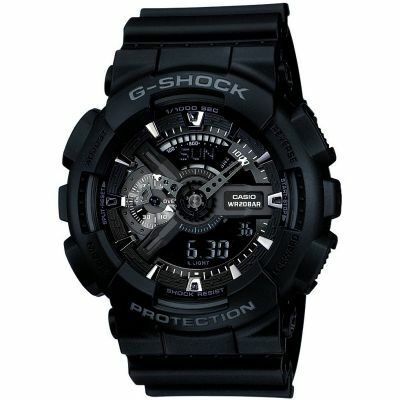 Casio G-Shock Military Black GA-110MB-1AER is a functional and very impressive Gents watch. Case material is Stainless Steel and Resin, which stands for a high quality of the item while the dial colour is LCD. The features of the watch include (among others) a chronograph and date function as well as an alarm. 200 metres water resistancy will protect the watch and allows it to be used for professional marine activity, skin diving and high impact water sports, but not deep sea or mixed gas diving. The watch is shipped with an original box and a guarantee from the manufacturer. Great product at a fantastic price. \r\nDelivery was very quick and communication regarding order was brilliant. \r\nWould definitely recommend would have no hesitation in ordering again from the watch shop. Great Product and really good service from Watch shop. Im really happy with the G-Shock watch. Absolutely excellent watch, especially for the price, you would think I had paid at least twice what I did. I love all the features, I bought it as a gift but want one myself. Great value and easy to operate. My partner was very pleased with this item as he works in a workshop operating heavy machinery and needed a watch that was reliable and hard-wearing. Firstly, the delivery was super fast. I ordered the watch in the afternoon, and it was at my door the following morning. It couldnt have been more efficient. Very happy with that service. The watch is awesome and arrived in secure factory packaging. Its solid - yet light on the arm, and I love the more prominent watch-face offered by the G-Shock Military. Its features require a bit of research plenty of helpful youtube video guides on its set up and use. Easy really. Overall, stoked and would buy from Watch Shop again without hesitation. Bought this watch for my husband he seems he like it a lot! received quickly as always have a few g shock watches this is stylish however the hands are hard to see at night as the light is very dim. Lovely watch, purchased for partner who is in the forces! He absolutely loved it and its perfect for professional uniform. Arrived the next day as stated well packaged and all correct. Brilliant quality and design features. Just what he wanted. Looks well built and strong. The unboxing experience had a really good professional feel the it withe the little tin it comes in with its pre cut foam slot that the watch perfectly sits in! Excellent watch, fits nicely to the wrist doesnt annoy me like other watches have in the past when playing sport! Quality product would recommend it to anyone looking to buy a watch. The display is really simple but effective and gives the impression of an expensive watch. Love the hint of red thrown in the display sets it off really well with the black surround. The only bad thing I can say for this watch is that there arent enough adjustment wholes in the strap as I have a small wrist I had to punch an additional hole for it to fit me. Overall an awesome buy I cant wait to buy the next one in a different colour. I bought this for my husbands birthday recently and he was so pleased with it. It was to replace another he has had for some years. They are strong long lasting watches and this particular one looks great as it is all black. After reading previous comments about it being too dark I asked my husband if he thought this but he said no as thats what the light is for and that he prefers it. So overall very pleased with my purchase. Thank you. Order this yesterday for my husbands Christmas present. It has just arrived, well done Watchshop cannot believe it arrived almost instantly. The packaging looks amazing and the watch itself seems perfect. Will be keeping it safe until Christmas Day but just wanted you to know that it had arrived and Im sure everything will be fine when he sees it. 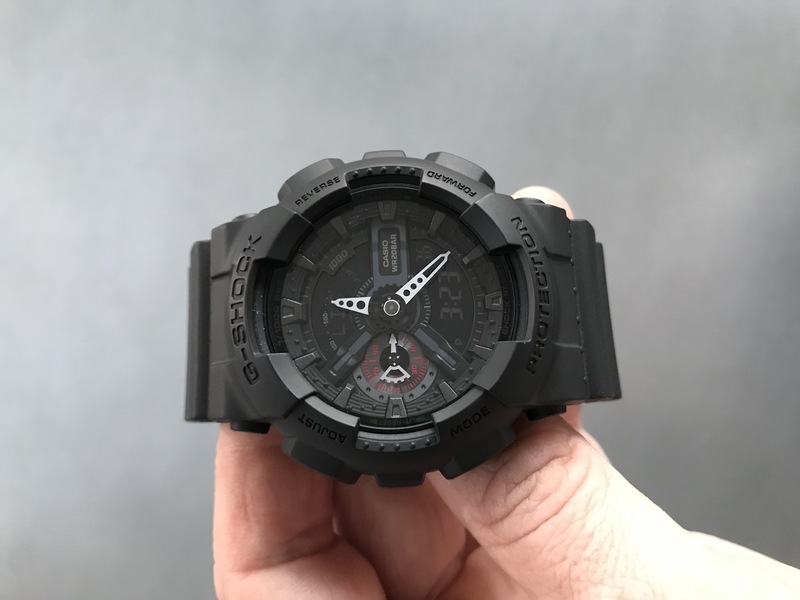 He has had Casio GShock watches for a long time and unfortunately his recent one just fell apart when having a new battery fitted. Thanks again Watchshop for getting this to me asap will definitely recommend your web site to anyone wanting a watch as you have such a vast collection. I bought the watch as a last Minute gift to myself before I headed of to Switzerland to work for the autumn and winter ski season. I used to wear Gshock watces 20 years ago so new they were both stylish and practical. I was not dissapointed. The watch is a nice large size on my wrist and looks really cool. It is easy to use and adjust. Gshock still provides great value for money and as a timepiece is something to be proud of. My advice is to buy one if you are on the fence as you wont be dissapointed. Made up with the overall look and feel of the watch. Perfect for daily use and eliminates the worry of scratching the watch due to its durable build. Definitely a must buy. The Gift is for Christmas but sure he will love it either way. Classic G-Shock. Solid design, pleasure to wear and of course - reliable. 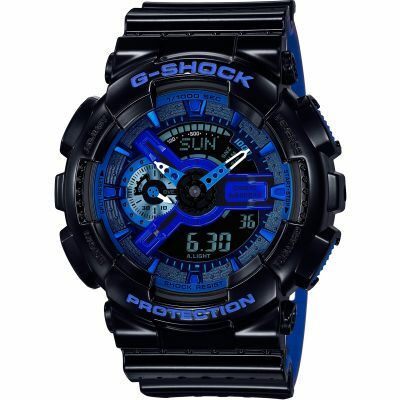 I recently purchased the mens Casio G shock Military watch, shock resistant, magnetic resistant. 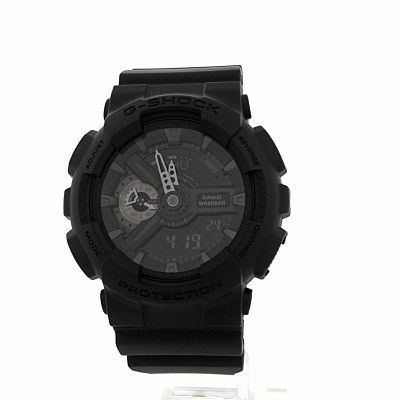 There are a number of choices from the Casio G Shock range, this watch stood out for me. When you see it up close the detail on this watch is quality the price that i payed on online at watchshop.co.uk was a nice price to, if you shop around the high street stores you could be paying a extra £35 - £40. The face detail on this watch is a black and grey background, a touch of red to set it off, white hands on the face The face colours are very subtle its not a bright face if you like bright colours this watch may not be for you. The watch strap has i would say, matt black finish, its a nice matt black, again the watch strap is a robust strap with high quality detail all around the strap. When i went to pick up my watch at one of the click and collect stores one of the assistants was commenting on the watch its self and the price i had paid online he was shocked could not believe the price. I had paid for this watch. I would highly recommend this quality watch, especially the price. I have had this watch for a week or so now and its brilliant. Very robust and a nice size on the wrist. I have seen some reviews that say the face is hard to read in low light. I can say that this is not the case. The face is easy to read and the light works well. A brilliant watch. Issues with order not going through - was resolved swiftly and received goodwill payment as price of the watch had changed from day to day. Great product, the face is slightly darker than shown which sometimes makes it difficult to see the time but this is a very rare event. The face is a good size and the strap is comfortable and do not catch on anything or corse an irritation. Well - after spending an hour in the Jewellery Qrtr looking at a range of Casio watches that had the same functions world time, 200m etc. and were priced between £2-300 Im ABSOLUTELY DELIGHTED with my £60 purchase here. I only wanted a cheaper watch than my Rolex as I didnt want my arm cut off while on holiday - I think Ill be ok with the Casio so will thoroughly enjoy owning it. I would recommend the site and the shopping facility/experience without reservation. Watch shop were by far the cheapest option I found online. Delivery time was also brilliant. Very pleased with this watch, looks good, and fast delivery. I wanted a watch to take on holiday, something rugged, water resistant enough to swim in but at the same time I wanted it relatively cheap and something I could wear on those evenings out. I had g-shocks in the past, so had a rough idea. The military black series are smart and understated. Large enough not to look silly on a big wrist and not too big to look as if it doesnt belong. Its simple to use with enough features for active people to busy themselves with. I really like the back light. Its a street light orange which at first u think would be pretty useless but actually works excellently, no blinding light at 2am when you check the time. The matt black colour feels functional and military while at the same time sophisticated. The strap is long enough for large wrists \\r\\n\\r\\nIf you are looking for a rugged wristwatch, choose a g-shock, if you want it to last, choose a g-shock and if you want it to have a bit of style, choose a g-shock. Im really pleased with it and glad I decided to go back to them. Excellent item. Great look, subtle. Good value. Nice watch, the display is very dark and the backlight isnt great but for a daytime watch its pretty smart. Good looking watch, nice fit and very practical. The colours go well together and overall give it a nice, clean look. Contains alarms, digital and analogue clock, water pressure, etc. Was a gift for my boyfriend and he loves it! Overall very happy with this product. Amazing looking watch, my fiancé loved it. Nice watch to use on a daily basis, easy to set up and functions are easy to master. Style and colour perfect for what I require.